When vertical scaling alone proves insufficient for scaling your InterSystems IRIS data platform to meet your workload’s requirements, you can consider distributed caching, an architecturally straightforward, application-transparent, low-cost approach to horizontal scaling. The InterSystems IRIS™ distributed caching architecture scales horizontally for user volume by distributing both application logic and caching across a tier of application servers sitting in front of a data server, enabling partitioning of users across this tier. Each application server handles user requests and maintains its own database cache, which is automatically kept in sync with the data server, while the data server handles all data storage and management. Interrupted connections between application servers and data server are automatically recovered or reset, depending on the length of the outage. Distributed caching allows each application server to maintain its own, independent working set of the data, which avoids the expensive necessity of having enough memory to contain the entire working set on a single server and lets you add inexpensive application servers to handle more users. Distributed caching can also help when an application is limited by available CPU capacity; again, capacity is increased by adding commodity application servers rather than obtaining an expensive processor for a single server. This architecture is enabled by the use of the Enterprise Cache Protocol (ECP), a core component of InterSystems IRIS® Data Platform™, for communication between the application servers and the data server. The distributed caching architecture and application server tier are entirely transparent to the user and to application code. You can easily convert an existing standalone InterSystems IRIS instance that is serving data into the data server of a cluster by adding application servers. InterSystems IRIS stores data in a file in the local operating system called a database. An InterSystems IRIS instance may (and usually does) have multiple databases. InterSystems IRIS applications access data by means of a namespace, which provides a logical view of the data stored in one or more databases. A InterSystems IRIS instance may (and usually does) have multiple namespaces. Each InterSystems IRIS instance maintains a database cache  a local shared memory buffer used to cache data retrieved from the databases, so that repeated instances of the same query can retrieve results from memory rather than storage, providing a very significant performance benefit. An InterSystems IRIS instance becomes an application server by adding another instance as a remote server, and then adding any or all of its databases as remote databases. This makes the second instance a data server for the first instance. Local namespaces on the application server are mapped to remote databases on the data server in the same way they are mapped to local databases. The difference between local and remote databases is entirely transparent to an application querying a namespace on the application server. The application server maintains its own database cache in the same manner as it would if using only local databases. ECP efficiently shares data, locks, and executable code among multiple InterSystems IRIS instances, as well as synchronizing the application server caches with the data server. The data server continues to store, update, and serve the data. The data server also synchronizes and maintains the coherency of the application servers’ caches to ensure that users do not receive or keep stale data, and manages locks across the cluster. Each query against the data is made in a namespace on one of the various application servers, each of which uses its own individual database cache to cache the results it receives; as a result, the total set of cached data is distributed across these individual caches. If there are multiple data servers, the application server automatically connects to the one storing the requested data. Each application server also monitors its data server connections and, if a connection is interrupted, attempts to recover it. The number of application servers in a cluster can be increased (or reduced) without requiring other reconfiguration of the cluster or operational changes, so you can easily scale as user volume increases. Storing data in its local databases. Synchronizing the application server database caches with the databases so the application servers do not see stale data. Managing the distribution of locks across the network. Monitoring the status of all application servers connections and taking action if a connection is interrupted for a specific amount of time (see ECP Recovery). Establishing connections to a specific data server whenever an application requests data that is stored on that server. Maintaining, in its cache, data retrieved across the network. Monitoring the status of all connections to the data server and taking action if a connection is interrupted for a specific amount of time (see ECP Recovery). A distributed cache cluster can include more than one data server (although this is uncommon). An InterSystems IRIS instance can simultaneously act as both a data server and an application server, but cannot act as a data server for the data it receives as an application server. Automatic, fail-safe operation. Once configured, ECP automatically establishes and maintains connections between application servers and data servers and attempts to recover from any disconnections (planned or unplanned) between application server and data server instances (see ECP Recovery). ECP can also preserve the state of a running application across a failover of the data server (see Distributed Caching and High Availability). Along with keeping data available to applications, these features make a distributed cache cluster easier to manage; for example, it is possible to temporarily take a data server offline or fail over as part of planned maintenance without having to perform any operations on the application server instances. Heterogeneous networking. InterSystems IRIS systems in a distributed cache cluster can run on different hardware and operating system platforms. ECP automatically manages any required data format conversions. A robust transport layer based on TCP/IP. ECP uses the standard TCP/IP protocol for data transport, making it easy to configure and maintain. Efficient use of network bandwidth. ECP takes full advantage of high-performance networking infrastructures. ECP is designed to automatically recover from interruptions in connectivity between an application server and the data server. In the event of such an interruption, ECP executes a recovery protocol that differs depending on the nature of the failure and on the configured timeout intervals. The result is that the connection is either recovered, allowing the application processes to continue as though nothing had happened, or reset, forcing transaction rollback and rebuilding of the application processes. For more information on ECP connections, see Monitoring Distributed Applications; for more information on ECP recovery, see ECP Recovery Protocol and ECP Recovery Process, Guarantees, and Limitations. While ECP recovery handles interrupted application server connections to the data server, the application servers in a distributed cache cluster are also designed to preserve the state of the running application across a failover of the data server. Depending on the nature of the application activity and the failover mechanism, some users may experience a pause until failover completes, but can then continue operating without interrupting their workflow. Data servers can be mirrored for high availability in the same way as a stand-alone InterSystems IRIS instance, and application servers can be set to automatically redirect connections to the backup in the event of failover. (It is not necessary or even possible to mirror an application server, as it does not store any data.) For detailed information about the use of mirroring in a distributed cache cluster, see Configuring ECP Connections to a Mirror the “Mirroring” chapter in the High Availability Guide. The other failover strategies detailed in the “System Failover Strategies” chapter of the High Availability Guide can also be used in a distributed cache cluster. Regardless of the failover strategy employed for the data server, the application servers reconnect and recover their states following a failover, allowing application processing to continue where it left off prior to the failure. An InterSystems IRIS distributed cache cluster consists of a data server providing data to one or more application servers, which in turn provide it to the application. This section describes procedures for deploying a distributed cache cluster. The recommended method for deploying InterSystems IRIS Data Platform is InterSystems Cloud Manager (ICM). By combining plain text declarative configuration files, a simple command line interface, the widely-used Terraform infrastructure as code tool, and InterSystems IRIS deployment in Docker containers, ICM provides you with a simple, intuitive way to provision cloud or virtual infrastructure and deploy the desired InterSystems IRIS architecture on that infrastructure, along with other services. ICM can deploy distributed cache clusters and other InterSystems IRIS configurations on Amazon Web Services, Google Cloud Platform, Microsoft Azure or VMware vSphere. ICM can also deploy InterSystems IRIS on an existing physical or virtual cluster. Deploy the Cluster with InterSystems Cloud Manager offers an overview of the process of using ICM to deploy the distributed cache cluster. For a brief introduction to ICM including a hands-on exploration of deploying InterSystems IRIS, see First Look: InterSystems Cloud Manager. For complete ICM documentation, see the InterSystems Cloud Manager Guide. You can also deploy a distributed cluster by using the management portal to configure existing or newly installed InterSystems IRIS instances; instructions for this procedure are provided in Deploy the Cluster Using the Management Portal. Information about securing the cluster after deployment is provided in Distributed Cache Cluster Security. The most typical distributed cache cluster configuration involves one InterSystems IRIS instance per system, and one cluster role per instance  that is, either data server or application server. When deploying using ICM, this configuration is the only option. The provided procedure for using the management portal assumes this configuration as well. While the data server and application server hosts can be of different operating systems and/or endianness, all InterSystems IRIS instances in a distributed cache cluster must use the same locale (see Using the NLS Settings Page of the management portal in the “Configuring InterSystems IRIS” chapter of the System Administration Guide). There are several stages involved in provisioning and deploying a containerized InterSystems IRIS configuration, including a distributed cache cluster, with ICM. The ICM Guide provides complete documentation of ICM, including details of each of the stages. This section briefly reviews the stages and provides links to the ICM Guide. ICM uses JSON files as both input and output. To provide the needed parameters to ICM, you must represent your target configuration and the platform on which it is to be deployed in two of ICM’s JSON configuration files: the defaults.json file, which contains information about the entire deployment, and the definitions.json file, which contains information about the types and numbers of the nodes provisioned and deployed by ICM, as well as details specific to each node type. For example, the defaults file determines which cloud provider your distributed cache cluster nodes are provisioned on and the locations of the required security files and InterSystems IRIS license keys, while the definitions file determines how many application servers are included in the sharded cluster and whether the data volume for the data server will be larger than for the application servers. Most ICM parameters have defaults; a limited number of parameters can be specified on the ICM command line as well as in the configuration file. For sample defaults and definitions files for distributed cache cluster deployment, see Define the Deployment in the “Using ICM” chapter of the ICM Guide. You can create your files by adapting the template defaults.json and definitions.json files provided with ICM in the /Samples directory (for example, /Samples/AWS for AWS deployments), or start with the contents of the samples provided in the documentation. For a complete list of the fields you can include in these files, see ICM Configuration Parameters in the “ICM Reference” chapter of the ICM Guide. The following table briefly lists the types of node (determined by the Role field in the definitions file) that ICM can provision, configure, and deploy services on, with the distributed cache cluster roles highlighted. For detailed descriptions of the node types, see ICM Node Types in the “ICM Reference” chapter of the ICM Guide. In the case of a distributed cache cluster, the provided link is for the data server instance. You perform these steps on the ECP Settings page of the management portal (System Administration > Configuration > Connectivity > ECP Settings). An InterSystems IRIS instance cannot actually operate as the data server in a distributed cache cluster until it is configured as such on the application servers. The procedure for preparing the instance to be a data server, however, includes one required action and two optional actions. For a detailed explanation of InterSystems services, see the “Services” chapter of the Security Administration Guide. The Time interval for Troubled state settings determines one of three timeouts used manage recovery of interrupted connections between application servers and the data server; leave it at the default of 60 until you have some data about the cluster’s operation over time. For more information on the ECP recovery timeouts, see ECP Recovery Protocol. Required  An application server can connect only if Use SSL/TLS is selected for this data server. Enabled  An application server can connect regardless of whether Use SSL/TLS is selected for this data server. Disabled  An application server cannot connect if Use SSL/TLS is selected (default) for this data server. For more information on using SSL/TLS in a distributed cache cluster, including authorization of secured application server connections on the data server, see Securing Application Server Connections to the Data Server with SSL/TLS. ECP uses some of the database cache on the data server to store various control structures; you may need to increase the size of the database cache or caches to accommodate this. For more information, see Increase Data Server Database Caches for ECP Control Structures. The data server is now ready to accept connections from valid application servers. Adding the data server instance as a data server on the application server instance. Add the desired databases on the data server as remote databases on the application server. As described for the data server in Preparing the Data Server, navigate to the ECP Settings page and enable the ECP service. Leave the settings on the This System as an ECP Application Server side set to the defaults. If the ECP SSL/TLS support setting for the data server you are adding is Enabled or Required, click the Set up SSL/TLS ‘%ECPClient’ link to create an ECP SSL/TLS configuration for the application server. (You can also do this in the ECP Data Server dialog in a later step.) For more information, see the Use SSL/TLS setting in the next step. Host DNS Name or IP Address  Specify the DNS name of the data server’s host or its IP address (in dotted-decimal format or, if IPv6 is enabled, in colon-separated format). If you use the DNS name, it resolves to an actual IP address each time the application server initiates a connection to that data server host. For more information, see the IPv6 Support section in the “Configuring InterSystems IRIS” chapter of the System Administration Guide. When adding a mirror primary as a data server (see the Mirror Connection setting), do not enter the virtual IP address (VIP) of the mirror, but rather the DNS name or IP address of the current primary failover member. IP Port  The port number defaults to 51773, the default InterSystems IRIS superserver (IP) port; change it as necessary to the superserver port of the InterSystems IRIS instance on the data server. If the ECP SSL/TLS support setting for the data server you are adding is Disabled, it does not matter whether you select this checkbox; SSL/TLS will not be not used to secure connections to the data server. If the ECP SSL/TLS support setting for the data server you are adding is Enabled, select this checkbox to use SSL/TLS to secure connections to this data server; clear it to not use SSL/TLS. If the ECP SSL/TLS support setting for the data server you are adding is Required, you must select this checkbox. If the ECP SSL/TLS support setting for the data server you are adding is Enabled or Required and you have not yet created an SSL/TLS configuration for the application server, click the Set up SSL/TLS ‘%ECPClient’ link to do so. For more information on using SSL/TLS in a distributed cache cluster, , including authorization of secured application server connections on the data server, see Securing Application Server Connections to the Data Server with SSL/TLS. Click Save. The data server appears in the data server list; you can remove or edit the data server definition, or change its status (see Monitoring Distributed Applications) using the available links. You can also view a list of all application servers connecting to a data server by going to the ECP Settings page on the data server and clicking the Application Servers button. Navigate to the Namespaces page by selecting System Administration on the management portal home page, then Configuration, then System Configuration, then Namespaces. Click Create New Namespace to display the New Namespace page. Enter a name for the new namespace, which typically reflects the name of the remote database it is mapped to. Select the data server from the Remote Server drop-down. Leave Remote directory set to Select directory from a list and select the data server database you want to map to the namespace using the Directory drop-down, which lists all of the database directories on the data server. Enter a local name for the remote database; this typically reflects the name of the database on the data server, the local name of the data server as specified in the previous procedure, or both. Click Finish to add the remote database and map it to the new namepsace. At The default database for Routines in this namespace is a, select Remote Database, then select the database you just created from the drop-down. The namespace does not need to be interoperability-enabled; to save time, you can clear the Make this an interoperability-enabled namespace check box. Select Save. The new namespace now appears in the list on the Namespaces list. Once you have added a data server database as a remote database on the application server, applications can query that database through the namespace it is mapped to on the application server. Remember that even though a namespace on the application server is mapped to a database on the data server, changes to the namespace mapped to that database on the data server are unknown to the application server. (For information about mapping, see Global Mappings in the “Configuring InterSystems IRIS” chapter of the System Administration Guide.) For example, suppose the namespace DATA on the data server has the default globals database DATA; on the application server, the namespace REMOTEDATA is mapped to the same (remote) database, DATA. If you create a mapping in the DATA namespace on the data server mapping the global ^DATA2 to the DATA2 database, this mapping is not propagated to the application server. Therefore, if you do not add DATA2 as a remote database on the application server and create the same mapping in the REMOTEDATA namespace, queries the application server receives will not be able to read the ^DATA2 global. When databases are encrypted on the data servers, you should also encrypt the IRISTEMP database on all connected application servers. The same or different keys can be used. For more information on database encryption, see the “Managed Key Encryption” chapter of the Security Administration Guide. If SSL/TLS is enabled on a data server, you can use it to secure connections from an application server to that data server. This protection includes X.509 certificate-based encryption. For detailed information about SSL/TLS and its use with InterSystems products, see the “Using SSL/TLS with InterSystems IRIS” chapter of the Security Administration Guide. Disabled  The use of SSL/TLS for application server connections to this data server is disabled, even for an application server on which Use SSL/TLS is selected. Enabled  The use of SSL/TLS for application server connections is enabled on the data server; SSL/TLS is used for connections from application servers on which Use SSL/TLS is selected, and is not used for connections from application servers on which Use SSL/TLS is not selected. Required  The data server requires application server connections to use SSL/TLS; an application server can connect to the data server only if Use SSL/TLS is selected for the data server, in which case SSL/TLS is used for all connections. Both instances must have an ECP SSL/TLS configuration. On the ECP Settings page, click Set up SSL/TLS ‘%ECPClient’ link on the application server side or the Set up SSL/TLS ‘%ECPServer’ link on the data server side. Complete the fields on the form in the Edit SSL/TLS Configurations for ECP dialog, These are analogous to those on the New SSL/TLS Configuration page, as described in the section Creating or Editing an SSL/TLS Configuration in the “Using SSL/TLS with InterSystems IRIS” chapter of the Security Administration Guide. However, there are no Configuration Name, Description, or Enabled fields; also, for the private key password, this page allows you to enter or replace one (Enter new password), specify that none is to be used (Clear password), or leave an existing one as it is (Leave as is). The path and name of a file that contains the X.509 certificate(s) in PEM format of the Certificate Authority (CA) or Certificate Authorities that this configuration trusts. You can specify either an absolute path or a path relative to the install-dir/mgr/ directory. For detailed information about X.509 certificates and their generation and use, see “Using SSL/TLS with InterSystems IRIS” chapter of the Security Administration Guide. This file must include the certificate(s) that can be used to verify the X.509 certificates belonging to other mirror members. If the file includes multiple certificates, they must be in the correct order, as described in Establishing the Required Certificate Chain in the “Using SSL/TLS with InterSystems IRIS” chapter of the Security Administration Guide, with the current instance’s certificate first. The full location of the configuration’s own X.509 certificate(s), in PEM format. This can be specified as either an absolute or a relative path. The full location of the configuration’s private key file, specified as either an absolute or relative path. The algorithm used to generate the private key, where valid options are DSA and RSA. Select Enter new password when you are creating an ECP SSL/TLS configuration, so you can enter and confirm the password for the private key associated with the certificate. Those communications protocols that the configuration considers valid; TLSv1.1, and TLSv1.2 are enabled by default. The set of ciphersuites used to protect communications between the client and the server. Typically you can leave this at the default setting. An application server must be authorized on a data server before it can connect using SSL/TLS. On the Services page (from the portal home page, select Security and then Services), click %Service_ECP. The Edit Service dialog displays. By default, the Allowed Incoming Connections box is empty, which means any application server can connect to this instance if the ECP service is enabled; click Add and enter a single IP address (such as 192.9.202.55) or fully-qualified domain name (such as mycomputer.myorg.com), or a range of IP addresses (for example,8.61.202210. * or 18.68.*.*). Once there are one or more entries on the list and you click Save in the Edit Service dialog, only the hosts specified by those entries can connect. You can always access the list as described and use a Delete to delete the host from the list or an Edit link to specify the roles associated with the host, as described in Controlling Access with Roles and Privileges. InterSystems uses a security model in which assets, including databases, are assigned to resources, and resources are assigned permissions, such as read and write. A combination of a resource and a permission is called a privilege. Privileges are assigned to roles, to which users can belong. In this way, roles are used to control user access to resources. For information about this model, see Authorization: Controlling User Access in the “About InterSystems Security” chapter of the Security Administration Guide. To be granted access to a database on the data server, the role held by the user initiating the process on the application server and the role set for the ECP connection on the data server must both include permissions for the same resource representing that database. For example, if a user belongs to a role on an application server that grants the privilege of read permission for a particular database resource, and the role set for the ECP connection on the data server also includes this privilege, the user can read data from the database on the application server. By default, InterSystems IRIS grants ECP connections on the data server the %All privilege when the data server runs on behalf of an application server. This means that whatever privileges the user on the application server has are matched on the data server, and access is therefore controlled only on the application server. For example, a user on the application server who has privileges only for the %DB_USER resource but not the %DB_IRISLIB resource can access data in the USER database on the data server, but attempting to access the IRISLIB database on the data server results in a <PROTECT> error. If a different user on the application server has privileges for the %DB_IRISLIB resource, the IRISLIB database is available to that user. InterSystems recommends the use of an LDAP server to implement centralized security. including user roles and privileges, across the application servers of a distributed cache cluster. For information about using LDAP with InterSystems IRIS, see the “Using LDAP” chapter of the Security Administration Guide. However, you can also restrict the roles available to ECP connections on the data server based on the application server host. For example, on the data server you can specify that when interacting with a specific application server, the only available role is %DB_USER. In this case, users on the application server granted the %DB_USER role can access the USER database on the data server, but no users on the application server can access any other database on the data server regardless of the roles they are granted. InterSystems strongly recommends that you secure the cluster by specifying available roles for all application servers in the cluster, rather than allowing the data server to continue to grant the %All privilege to all ECP connections. InterSystems IRIS always grants the data server the %DB_IRISSYS role since it requires Read access to the IRISSYS database to run. This means that a user on an application server with %DB_IRISSYS can access the IRISSYS database on the data server. Do not grant the user privileges for the %DB_IRISSYS resource. On the data server, change the name of the resource for the IRISSYS database to something other than %DB_IRISSYS, making sure that the user on the application server has no privileges for that resource. If the data server has any public resources, they are available to any user on the ECP application server, regardless of either the roles held on the application server or the roles configured for the ECP connection. Go to the Services page (from the portal home page, select Security and then Services) and click %Service_ECP to deiplay the Edit Service dialog. Click the Edit link for the application server host you want to restrict to display the Select Roles area. To specify roles for the host, select roles from those listed under Available and click the right arrow to add them to the Selected list. To remove roles from the Selected list, select them and then click the left arrow. By default, a listed host holds the %All role, but if you specify one or more other roles, these roles are the only roles that the connection holds. Therefore, a connection from a host or IP range with the %Operator role has only the privileges associated with that role, while a connection from a host with no associated roles (and therefore %All) has all privileges. Changes to the roles available to application server hosts and to the public permissions on resources on the data server require a restart of InterSystems IRIS before taking effect. 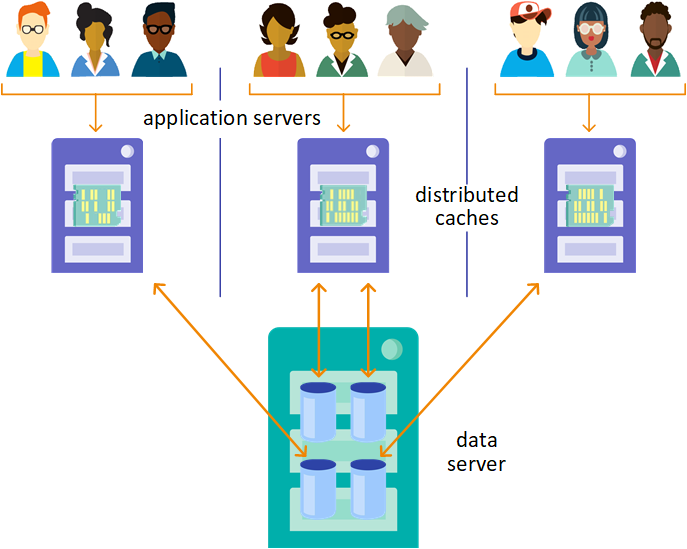 A running distributed cache cluster consists of a data server instance  a data provider  connected to one or more application server systemsdata consumers. Between each application server and the data server, there is an ECP connection  a TCP/IP connection that ECP uses to send data and commands. You can monitor the status of the servers and connections in a distributed cache cluster on the ECP Settings page (System Administration > Configuration > Connectivity > ECP Settings). This System as an ECP Data Server displays settings for the data server as well as the status of the ECP service. This System as an ECP Application Server displays settings for the application server. Click the Data Servers button on the ECP Data Servers Settings page (System Administration > Configuration > Connectivity > ECP Settings) to display the ECP Data Servers page, which lists the current data server connections on the application server. The ECP Application Servers page, which you can display by clicking the Application Servers button on the ECP Settings page, contains a list of the current application server connections on the data server. The logical name of the data server system on this connection, as entered when the server was added to the application server configuration. The host name of the data server system, as entered when the server was added to the application server configuration. The IP port number used to connect to the data server. The current status of this connection. Connection states are described in the ECP Connection States section. From each data server row you can change the status of an existing ECP connection with that data server; see the ECP Connection Operations section for more information. You can delete the data server information from the application server. The logical name of the application server on this connection. The port number used to connect to the application server. In the Connection in Progress state, a network daemon exists for the connection and actively tries to establish a connection to the data server; when the connection is established, it enters the Normal state. While the connection is in the Connection in Progress state, the user process must wait for up to 20 seconds for it to be established. If the connection is not established within that time, the user process receives a <NETWORK> error. After a connection completes, it enters the Normal (data transfer) state. In this state, the application server-side daemons exist and actively send requests and receive answers across the network. The connection stays in the Normal state until the connection becomes unworkable or until the application server or the data server requests a shutdown of the connection. If the connection from the application server to the data server encounters problems, the application server ECP connection enters the Trouble state. In this state, application server ECP daemons exist and are actively try to restore the connection. An underlying TCP connection may or may not still exist. The recovery method is similar whether or not the underlying TCP connection gets reset and must be recreated, or if it stops working temporarily. During the application server Time to wait for recovery timeout (default of 20 minutes), the application server attempts to reconnect to the data server to perform ECP connection recovery. During this interval, existing network requests are preserved, but the originating application server-side user process blocks new network requests, waiting for the connection to resume. If the connection returns within the Time to wait for recovery timeout, it returns to the Normal state and the blocked network requests proceed. Similarly, if the data server shuts down, either gracefully or as a result of a crash, and then restarts, it enters a short period (approximately 30 seconds) during which it allows application servers to reconnect and recover their existing sessions. Once again, the application server and the data server engage in the recovery protocol. If connection recovery is not complete within the Time to wait for recovery timeout, the application server gives up on connection recovery. Specifically, the application server returns errors to all pending network requests and changes the connection state to Not Connected. If it has not already done so, the data server rolls back all the transactions and releases all the locks from this application server the next time this application server connects to the data server. When an ECP server instance starts up, all incoming ECP connections are in an initial “unassigned” Free state and are available for connections from any application server that is listed in the connection access control list. If a connection from an application server previously existed and has since gone away, but does not require any recovery steps, the connection is placed in the “idle” Free state. The only difference between these two states is that in the idle state, this connection block is already assigned to a particular application server, rather than being available for any application server that passes the access control list. In the data server Normal state, the application server connection is normal. At any point in the processing of incoming connections, whenever the application server disconnects from the data server (except as part of the data server’s own shutdown sequence), the data server rolls back any pending transactions and releases any incoming locks from that application server, and places the application server connection in the “idle” Free state. If the application server is not responding, the data server shows a Trouble state. If the data server crashes or shuts down, it remembers the connections that were active at the time of the crash or shutdown. After restarting, the data server waits for a brief time (usually 30 seconds) for application servers to reclaim their sessions (locks and open transactions). If an application server does not complete recovery during this awaiting recovery interval, all pending work on that connection is rolled back and the connection is placed in the “idle” state. The data server connection is in a recovery state for a very short time when the application server is in the process of reclaiming its session. The data server keeps the application server in trouble state for the Time interval for Troubled state timeout (default is 60 seconds) for it to reclaim the connection; otherwise, it releases the application resources (rolls back all open transactions and releases locks) and then sets the state to Free. Set the state of this connection to Disabled. This releases any locks held for the application server, rolls back any open transactions involving this connection, and purges cached blocks from the data server. If this is an active connection, the change in status sends an error to all applications waiting for network replies from the data server. Set the state of this connection to Not Connected. As with changing the state to Disabled, this releases any locks held for the application server, rolls back any open transactions involving this connection, and purges cached blocks from the data server. If this is an active connection, the change in status sends an error to all applications waiting for network replies from the data server. This chapter discusses application development and design issues that are helpful if you would like to deploy your application on a distributed cache cluster, either as an option or as its primary configuration. With InterSystems IRIS, the decision to deploy an application as a distributed system is primarily a runtime configuration issue (see Deploying a Distributed Cache Cluster). Using InterSystems IRIS configuration tools, map the logical names of your data (globals) and application logic (routines) to physical storage on the appropriate system. When the connection between an application server and data server is interrupted, the application server attempts to reestablish its connection with the data server, repeatedly if necessary, at an interval determined by the Time between reconnections setting (5 seconds by default). When the interruption is brief, the connection is recovered. If the connection is reestablished within the data server’s configured Time interval for Troubled state timeout period (60 seconds by default), the data server restores all locks and open transactions to the state they were in prior to the interruption. If the interruption is longer, the data server resets the connection, so that it cannot be recovered when the interruption ends. If the connection is not reestablished within the Time interval for Troubled state, the data server unilaterally resets the connection, allowing it to roll back transactions and release locks from the unresponsive application server so as not to block functioning application servers. When connectivity is restored, the connection is disabled from the application server point of view; all processes waiting for the data server on the interrupted connection receive a <NETWORK> error and enter a rollback-only condition. The next request received by the application server establishes a new connection to the data server. If the interruption is very long, the application server also resets the connection. If the connection is not reestablished within the application server’s longer Time to wait for recovery timeout period (20 minutes by default), the application server unilaterally resets the connection; all processes waiting for the data server on the interrupted connection receive a <NETWORK> error and enter a rollback-only condition. The next request received by the application server establishes a new connection to the data server, if possible. The ECP timeout settings are shown in the following table. Each is configurable on the System > Configuration > ECP Settings page of the Management Portal, or in the ECP section of the iris.cpf file (see ECP in the Configuration Parameter File Reference). Time between reconnections ClientReconnectInterval 5 seconds 160 seconds The interval at which an application makes attempts to reconnect to the data server. Time interval for Troubled state ServerTroubleDuration 60 seconds 2065535 seconds The length of time for which the data server waits for contact from the application server before resetting an interrupted connection. Time to wait for recovery ClientReconnectDuration 1200 seconds (20 minutes) 1065535 seconds The length of time for which an application server continues attempting to reconnect to the data server before resetting an interrupted connection. Avoid tying up data server resources that could be used for other application servers for a long time by waiting for an application server to become available. Give an application server  which has nothing else to do when the data server is not available  the ability to wait out an extended connection interruption for much longer by trying to reconnect at frequent intervals. ECP relies on the TCP physical connection to detect the health of the instance at the other end without using too much of its capacity. On most platforms,you can adjust the TCP connection failure and detection behavior at the system level. While an application server connection becomes inactive, the data server maintains an active daemon waiting for new requests to arrive on the connection, or for a new connection to be requested by the application server. If the old connection returns, it can immediately resume operation without recovery. When the underlying heartbeat mechanism indicates that the application server is completely unavailable due to a system or network failure, the underlying TCP connection is quickly reset. Thus, an extended period without a response from an application server generally indicates some kind of problem on the application server that caused it to stop functioning, but without interfering with its connections. If the underlying TCP connection is reset, the data server puts the connection in an “awaiting reconnection” state in which there is no active ECP daemon on the data server. A new pair of data server daemons are created when the next incoming connection is requested by the application server. Collectively, the nonresponsive state and the awaiting reconnection state are known as the data server Trouble state. The recovery required in both cases is very similar. If the data server fails or shuts down, it remembers the connections that were active at the time of the crash or shutdown. After restarting, the data server has a short window (usually 30 seconds) during which it places these interrupted connections in the awaiting reconnection state. In this state, the application server and data server can cooperate together to recover all the transaction and lock states as well as all the pending Set and Kill transactions from the moment of the data server shutdown. During the recovery of an ECP-configured instance, InterSystems IRIS guarantees a number of recoverable semantics, and also specifies limitations to these guarantees. ECP Recovery Process, Guarantees, and Limitations describes these in detail, as well as providing additional details about the recovery process. 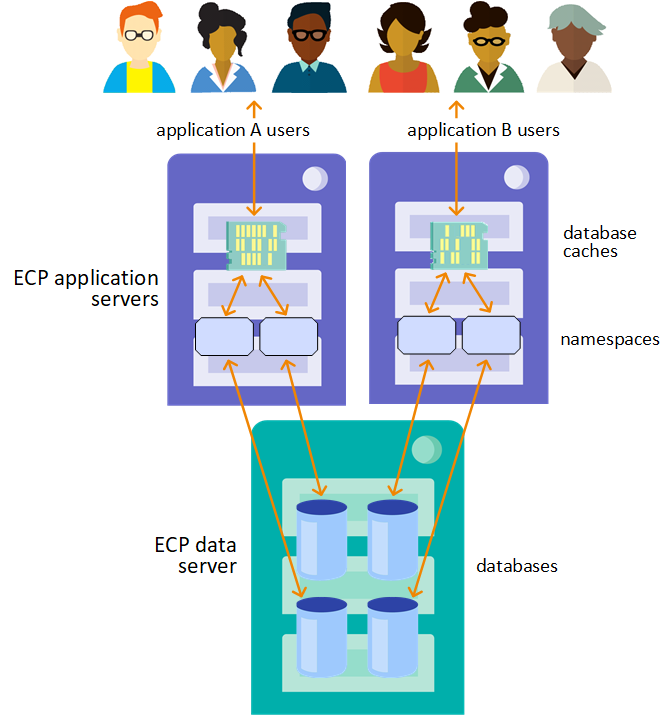 By default, ECP automatically manages the connection between an application server and a data server. When an ECP-configured instance starts up, all connections between application servers and data servers are in the Not Connected state (that is, the connection is defined, but not yet established). As soon as an application server makes a request (for data or code) that requires a connection to the data server, the connection is automatically established and the state changes to Normal. The network connection between the application server and data server is kept open indefinitely. In some applications, you may wish to close open ECP connections. For example, suppose you have a system, configured as an application server, that periodically (a few times a day) needs to fetch data stored on a data server system, but does not need to keep the network connection with the data server open afterwards. In this case, the application server system can issue a call to the SYS.ECP.ChangeToNotConnected method to force the state of the ECP connection to Not Connected. Removes any locks on the data server that were opened by the application server. Rolls back the data server side of any open transactions. The application server side of the transaction goes into a “rollback only” condition. After completion of the state change to Not Connected, the next request for data from the data server automatically reestablishes the connection. See Data Server Connections for information about changing data server connection status from the management portal. InterSystems strongly discourages establishing multiple duplicate ECP channels between an application server and a data server to try to increase bandwidth. You run the dangerous risk of having locks and updates for a single logical transaction arrive out-of-sync on the data server, which may result in data inconsistency. For example, if the 16 KB block size is enabled in addition to the default 8 KB block size, and there are six application servers, each with an 8 KB database cache of 2 GB and a 16 KB database cache of 4 GB, you should adjust the data server’s 8 KB database cache to ensure that 52 MB (50MB + [12 GB * .01]) is available for control structures, and the 16 KB cache to ensure that 2 MB (24 GB * .005) is available for control structures (rounding up in both cases). For information about allocating memory to database caches, see Memory and Startup Settings in the “Configuring InterSystems IRIS” chapter of the System Administration Guide. 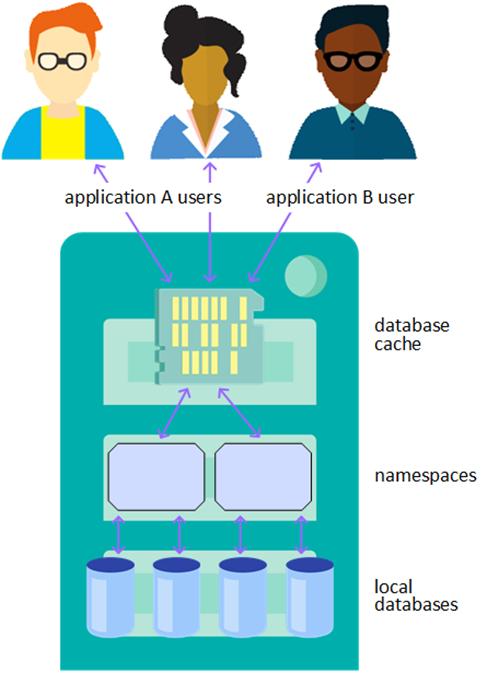 Connecting users to application servers in a round-robin or load-balancing scheme may diminish the benefit of caching on the application server. This is particularly true if users work in functional groups that have a tendency to read the same data. As these users are spread among application servers, each application server may end up requesting exactly the same data from the data server, which not only diminishes the efficiency of distributed caching using multiple caches for the same data, but can also lead to increased block invalidation as blocks are modified on one application server and refreshed across other application servers. This is somewhat subjective, but someone very familiar with the application characteristics should consider this possible condition. Restrict updates within a single transaction to either a single remote data server or the local server. When a transaction includes updates to more than one server (including the local server) and the TCommit cannot complete successfully, some servers that are part of the transaction may have committed the updates while others may have rolled them back. For details, see Commit Guarantee in “ECP Recovery Guarantees and Limitations”. Updates to IRISTEMP are not considered part of the transaction for the purpose of rollback, and, as such, are not included in this restriction. Temporary (scratch) globals should be local to the application server, assuming they do not contain data that needs to be globally shared. Often, temporary globals are highly active and write-intensive. If temporary globals are located on the data server, this may penalize other application servers sharing the ECP connection. Repeated references to a global that is not defined (for example, $Data(^x(1)) where ^x is not defined) always requires a network operation to test if the global is defined on the data server. A common operation in online transaction processing systems is generating a series of unique values for use as record numbers or the like. In a typical relational application, this is done by defining a table that contains a “next available” counter value. When the application needs a new identifier, it locks the row containing the counter, increments the counter value, and releases the lock. Even on a single-server system, this becomes a concurrency bottleneck: application processes spend more and more time waiting for the locks on this common counter to be released. In a networked environment, it is even more of a bottleneck at some point. InterSystems IRIS addresses this by providing the $Increment function, which automatically increments a counter value (stored in a global) without any need of application-level locking. Concurrency for $Increment is built into the InterSystems IRIS database engine as well as ECP, making it very efficient for use in single-server as well as in distributed applications. Applications built using the default structures provided by InterSystems IRIS objects (or SQL) automatically use $Increment to allocate object identifier values. $Increment is a synchronous operation involving journal synchronization when executed over ECP. For this reason, $Increment over ECP is a relatively slow operation, especially compared to others which may or may not already have data cached (in either the application server database cache or the data server database cache). The impact of this may be even greater in a mirrored environment due to network latency between the failover members. For this reason, it may be useful to redesign an application to assign a batch of new values to each application server and use $Increment with that local batch within each application server, involving the data server only when a new batch of values is needed. (This approach cannot be used, however, when consecutive application counter values are required.) The $Sequence function can also be helpful in this context, as an alternative to or used in combination with $Increment. A <NETWORK> error indicates an error that could not be handled by the normal ECP recovery mechanism. In an application, it is always acceptable to halt a process or roll back any pending work whenever a <NETWORK> error is received. Some <NETWORK> errors are essentially fatal error conditions. Others indicate a temporary condition that might clear up soon; however, the expected programming practice is to always roll back any pending work in response to a <NETWORK> error and start the current transaction over from the beginning. The application-side rollback-only condition occurs when the data server detects a network failure during a transaction initiated by the application server and enters a state in which all network requests are met with errors until the transaction is rolled back. The ECP recovery protocol is summarized in ECP Recovery Protocol. This section describes ECP recovery in detail, including its guarantees and limitations. During the recovery of an ECP-configured system, InterSystems IRIS guarantees a number of recoverable semantics which are described in detail in ECP Recovery Guarantees. Limitations to these guarantees are described in detail in the ECP Recovery Limitations section of the aforementioned appendix. In these descriptions, Process A, Process B and so on refer to processes attempting update globals on a data server. These processes may originate on the same or different application servers, or on the data server itself; in some cases the origins of processes are specified, in others they are not germane. Process A executes a TStart for Transaction T, locks global ^x on DataServer S, and unlocks ^x (unlock does not specify the “immediate unlock” lock type). InterSystems IRIS guarantees that the lock on ^x is not released until the transaction has been either committed or rolled back. No other process can acquire a lock on ^x until Transaction T either commits or rolls back on DataServer S.
An data server crashes in the middle of an application server transaction, restarts, and completes recovery within the application server recovery timeout interval. InterSystems IRIS expects but does not guarantee that in the absence of continuing faults (whether in the network, the data server, or the application server hardware or software), all or most of the transactions pending into a data server at the time of a data server outage are recovered. The ECP Lock Guarantee still applies as long as all the modified data is journaled. If data is not being journaled, updates made to the data server before the crash can disappear without notice to the application server. InterSystems IRIS no longer guarantees that a process that acquires the lock sees all the updates that were made earlier by other processes while holding the lock. If a data server crashes while the application server has a $Increment request outstanding to the data server and the global is journaled, InterSystems IRIS attempts to recover the $Increment results from the journal; it does not re-increment the reference. If an application server downloads routines from a data server and the data server restarts (planned or unplanned), the routines downloaded from the data server are marked as if they had been edited. In InterSystems IRIS, the Lock command is only advisory. If Process A starts a transaction that is updating global ^x under protection of a lock on global ^y, and another process modifies ^x without the protection of a lock on ^y, the rollback of ^x does not work. Rollback depends on the reliability and completeness of the journal. If something interrupts the continuity of the journal data, rollbacks do not succeed past the discontinuity. InterSystems IRIS silently ignores this type of transaction rollback. A journal discontinuity can be caused by executing ^JRNSTOP while InterSystems IRIS is running, by deleting the Write Image Journal (WIJ) file after an InterSystems IRIS shutdown and before restart, or by an I/O error during journaling on a system that is not set to freeze the system on journal errors.